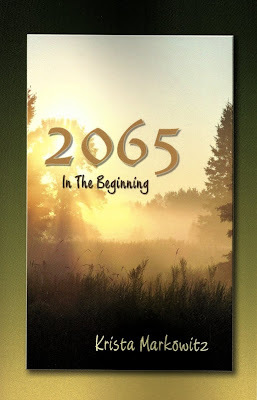 "2065 In the Beginning" booksigning June 11th at Florey's ! Florey's Book Co. welcomes local Pacifica author Krista Markowitz as she discusses her new book "2065 In the Beginning". More than thirty have passed since the sudden blast of sweetness and universal understanding changed everything. People all over the world have dropped the money standard to join in pods of like-minded others— where all resources are shared, borrowed or bartered and where creativity and freedom of choice are the guiding principles. And the higher capabilities- telepathy, clairvoyance, clairaudience, and the like are gradually becoming the norm. Welcome to Art Pod in the year 2064. Follow the adventures and learning of ten-year-old Jeori as his life gradually intertwines with his telepathic and outgoing neighbor, Kayla, and fifteen-year-olds Cleo and Kadrun. It is to the loner Kadrun— dubbed Mr. Black by his pod mates- that the forces of darkness first come, threatening his life and sanity. As threads of age-old fears begin to insidiously spread throughout the world, it is Kad who holds the key to Earth’s future. Krista Markowitz is founder and CEO of Her Own Life. She loves digging in the earth, laughing with family and friends, free-style oil painting, and channeling surprising stories. Krista has also authored 'Mrs. Tipperwillow's Afterlife Adventures', a book about the spirit world for kids and kids at heart, and 'About Afterlife: Two Kid's Stories'. 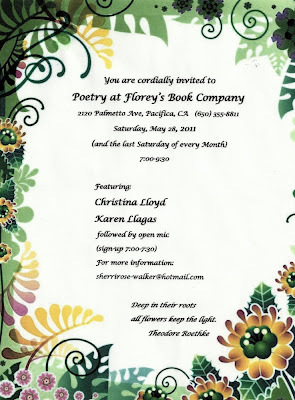 May 28th Poetry at Florey's details! 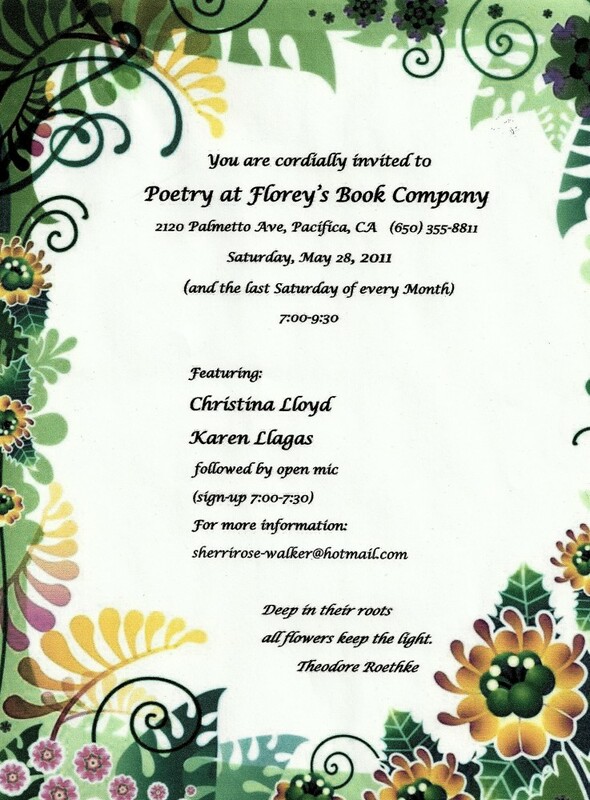 Florey's Books would like to invite you to the May Poetry at Florey's event. Born in Hong Kong, raised in the Philippines and educated in the United States, Christina has lived and worked as an English teacher in Costa Rica, Japan and Ireland. She has also worked with CPITS. Currently, she teaches Spanish, and lives by the ocean in San Francisco. Territories, first chapbook, was published in 2010. Karen has an MFA degree from Warren Wilson Program for Writers, and a BA in Economics from Ateneo de Manila. A recipient of a Hedgebrook residency and a Dorothy Sargent Rosenberg Poetry Prize, she lives in San Francisco where she works as a Tagalog interpreter and instructor, and a poet-teacher with the California Poets in the Schools (CPITS). Her first book, Archipelago Dust was published in 2010. They will be followed by an open mic period. Sign-up for the open mic is from 7:00 to 7:30pm.